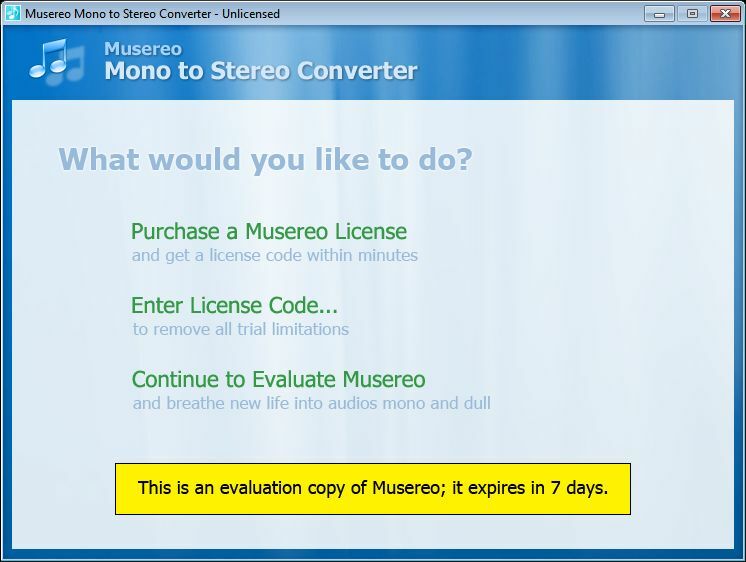 Musereo Mono to Stereo Converter est un logiciel simple et facile d'utilisation qui convertit vos fichiers mp3/wma/wav mono en stereo. 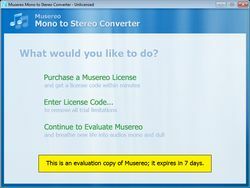 L'offre gratuite du jour pour Musereo Mono to Stereo Converter était valable le 27 août 2010! 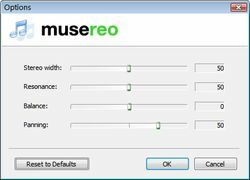 Musereo Mono to Stereo Converter est un logiciel simple et facile d'utilisation qui convertit vos fichiers mp3/wma/wav mono en stereo en quelques clics seulement, vous aidant à donner une nouvelle vie à vos vieux fichiers audio mono. Vous pouvez ajuster la largeur stéréo, la richesse harmonique, et la balance des niveaux. Il est spécialement optimisé pour les amateurs d'écouteurs. Qui plus est, si le fichier musical est initialement en mono car ancien, modifier ceci, c'est modifier la volonté initiale du compositeur de la musique.. Et le compositeur actuel n'aura que faire d'un tel logiciel puisque tout les DAW permettent de faire une telle manipulation et ce, sans la moindre difficulté. Logiciel totalement ridicule... Si le fichier est initialement en mono, le "rendre" stéréo ne fait tout au plus qu'ajouter de l'espace, en largeur.... Ce qui sera totalement inesthétique et froid... Qui plus est, si le fichier musical est initialement en mono car ancien, modifier ceci, c'est modifier la volonté initiale du compositeur de la musique.. Et le compositeur actuel n'aura que faire d'un tel logiciel puisque tout les DAW permettent de faire une telle manipulation et ce, sans la moindre difficulté. C'est un programme pourri que tu trouves sur le Web par exemple. eh ben, ca reste un programme pourri. des fichiers monos en stéréo, ça reste des fichiers mono, non? Audacity will do this for free, but then todays giveaway is also free (for today) so I decided to give it a try. It DOES improve mono recordings giving them a "fuller sound". I tested it on an instumental album from 1956 which I knew to be in mono....and overall I'm quite pleased with the result. I also agree it's overpriced and a before & after musical sample would have been useful. Hey...what have you got to lose...it's only a 2 megabyte install. Downloaded, installed, activated, and registered fine on Vista x32 OS. 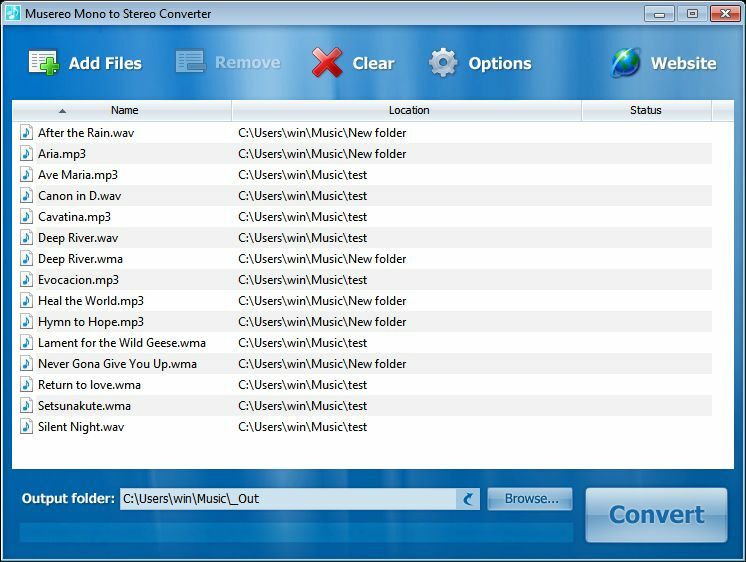 Program is very easy to use - simple, clear instructions are provided on the GUI main screen, and adding a music file and converting it were a breeze. 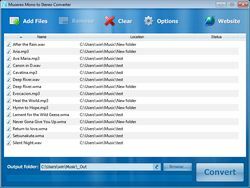 MP3, WAV, WMA formats are supported. To be honest, there didn't seem to be much (if any) difference between the original music file and the converted file - they both sounded the same to me - so, as a freebie for today, it's okay - but I wouldn't pay $39 for a one-trick-pony program that doesn't seem to do mono-to-stereo music conversions effectively - $10 (maximum) is a much more reasonable price for such software. Anything to do with sound/music is great in my book but $39 for a basic delay between left and right (I always called it fake stereo) is outrageous! Seriously, maybe $10 (tops) and I wouldn't be surprised if there isn't a freebie out there does this. Stereophonic sound is created in recording studios using at least two mikes multichannel equipment. From the technical point of view it's impossible to create stereo recording out of mono one. At its best it will be artificial so-called 'pseudo stereo'. So in my opinion the usefulness of this program is next to zero even if it were freeware. It's not about being "whiny" - it's about giving feedback (although, I will admit, sometimes people do seem to whine a bit). Just for background, I own a recording studio, and I do a lot of work engineering audio. I use ProTools, Cubase, Acid, Audition, and yes... even on occasions, Audacity. I understand the physics behind stereo and the art of recording. Does this give an easy way to give a fuller, richer sound to basic mono tracks. Sure. I downloaded it and tested it, and it does. Will it give "stereo" effect? No. It just doesn't work that way. it raises the volume, gives and gives a bit of off-set reverb. But it's not stereo. Still, if you have some mono tracks and all you want to do is make them a bit fuller, this will do the trick. Not a program I will use regularly, but I can see why some would use it. It's worth the give-away-of-the-day price. It's not about being "whiny" - it's about giving feedback (although, I will admit, sometimes people do seem to whine a bit). Just for background, I own a recording studio, and I do a lot of work engineering audio. I use ProTools, Cubase, Acid, Audition, and yes... even on occasions, Audacity. I understand the physics behind stereo and the art of recording. Does this give an easy way to give a fuller, richer sound to basic mono tracks. Sure. I downloaded it and tested it, and it does. Will it give "stereo" effect? No. It just doesn't work that way. it raises the volume, gives and gives a bit of off-set reverb. But it's not stereo. Still, if you have some mono tracks and all you want to do is make them a bit fuller, this will do the trick. Not a program I will use regularly, but I can see why some would use it. It's worth the give-away-of-the-day price.